BMW is a brand that has always been associated with the joy of driving. The same is also depicted in their tagline ‘Sheer Driving Pleasure’. All their products have always been designed in such a way that they make every moment behind the wheel a pleasurable one, something that we enthusiasts appreciate. This has to do with both the engines and the driving dynamics that their range offers. When BMW launched the facelifted 3 Series earlier in the year, it sadly didn’t come with a petrol option. With the ‘Diesel ban’ getting serious and people looking away from diesel products, BMW took this as an oppurtunity and introduced the petrol version of 3 Series, the 320i. We spent some time with it to see whether it lives up to the tag line of the brand or not. 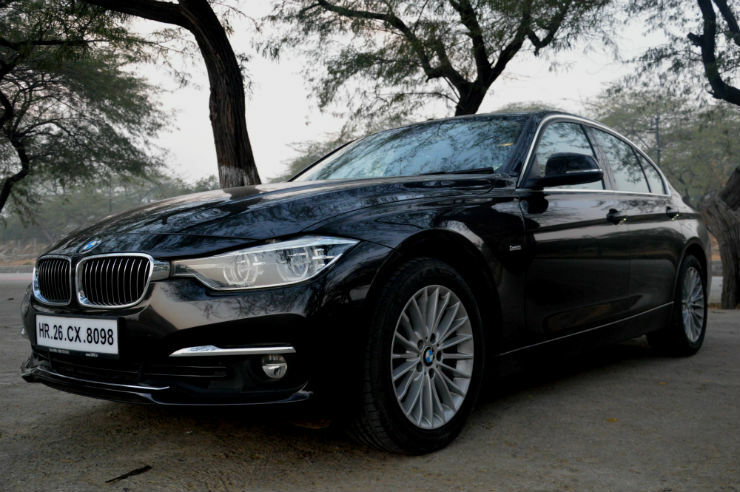 The 3 Series has always been a sharp looking vehicle, the LCi just added to that. 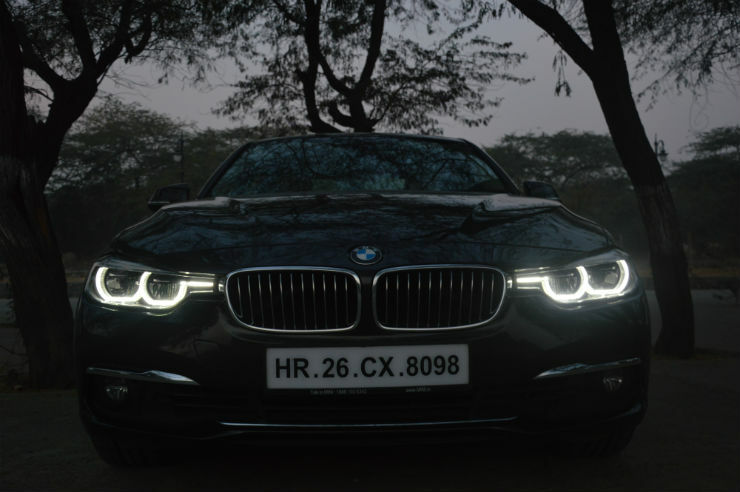 The 3 now gets LED headlamps as standard, which give the car a distinctive look. Like all BMWs, this too has the dual Corona rings, albeit more squarish than the round ones that were previously on offer. This one has the extended LED line that goes all the way into the grill. 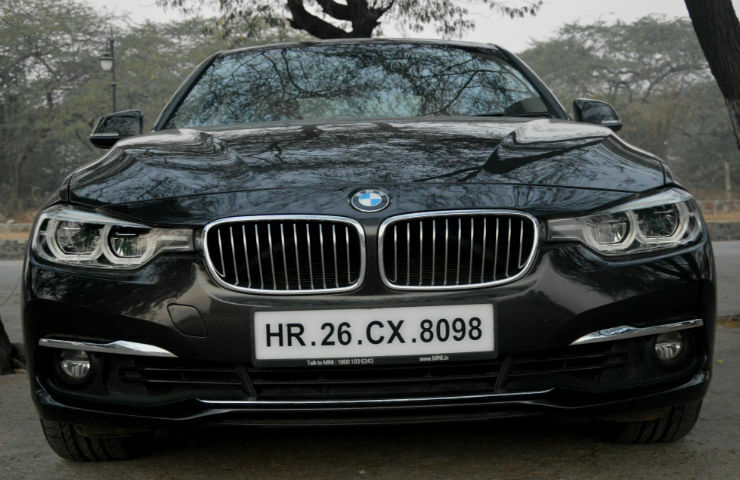 The kidney grill, a BMW trademark has been finished in chrome and has 11 slats, as opposed to the 8 slats on other variants. 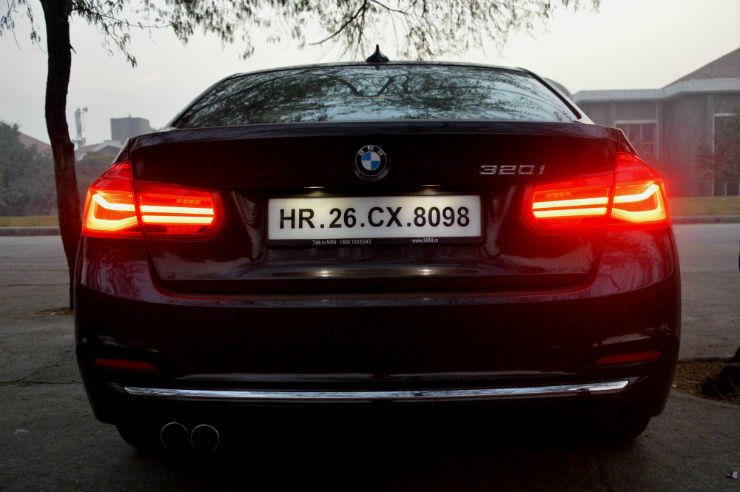 This brings us to the fact that the 320i comes in either base Prestige trim or the Luxury Line trim. There is extensive use of chrome everywhere, given that this is the Luxury line. The window sills, the front bumper and the rear bumper have chrome accents, something that we’d personally black out to give it a better look. But then again, the Indian market loves chrome, so most people will be satisfied. The rear gets new LED tail lamps. Our car came fitted with the 17″ multi-spoke rims aimed more towards elegance than outright sportiness. The 3 has always been a good looking vehicle in our opinion and with this update, it continues to look sharp and appealing. There are very few changes that have taken place on the inside. 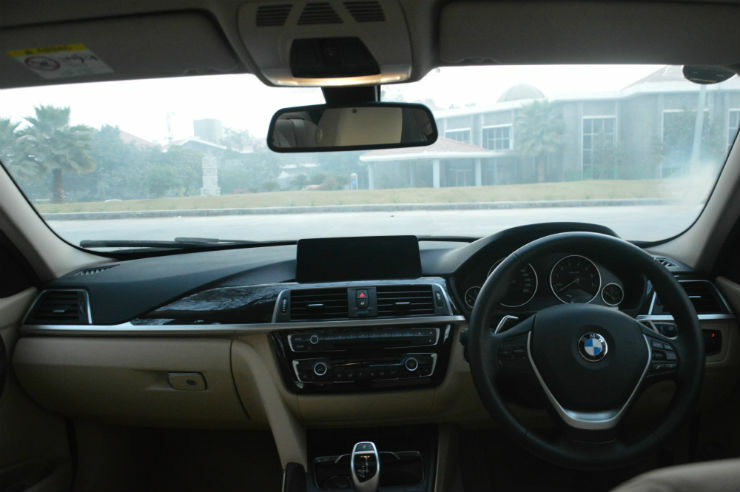 For starters, you now get the larger iDrive screen (22.3 cm) which makes navigating through the car menu easier. It comes with 20 gb internal memory and has navigation on offer too. 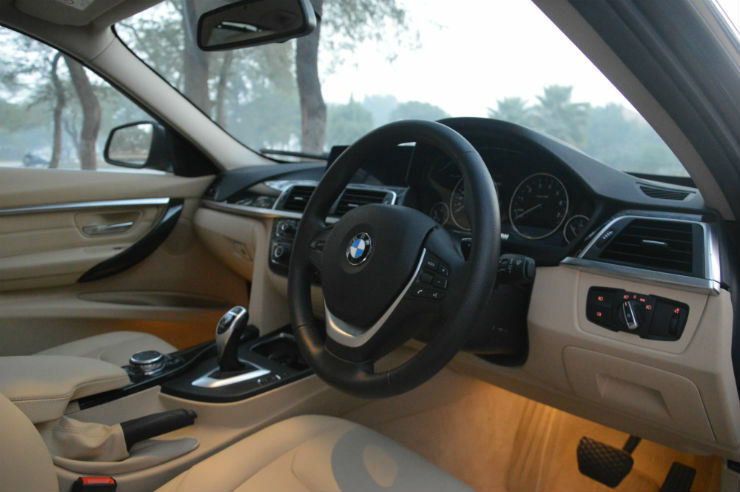 Like every BMW, the dash is tilted slightly towards the driver and it is pretty well laid out. It houses buttons that control the stereo and the AC. 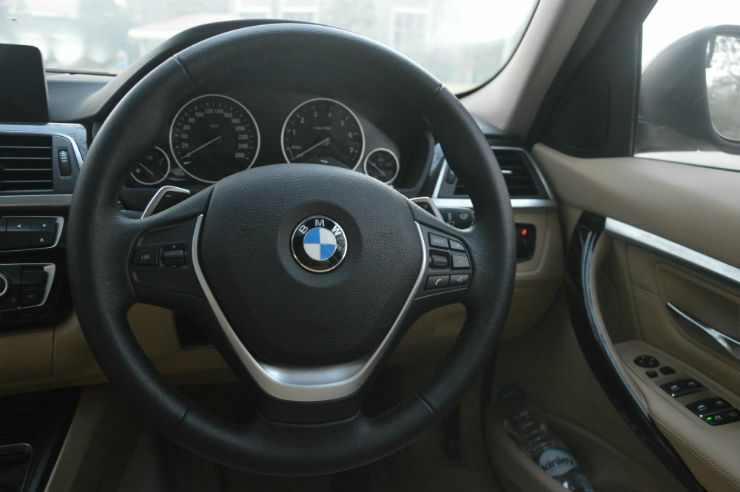 The car comes with a multifunction steering wheel with paddle shifters. One feature that has been skipped out on is cruise control, something that is evident when you see the steering wheel. Also missing is front parking sensors, something we think that BMW should incorporate into the range, atleast the higher trim levels. Since people in India believe in blinding you by driving with the highbeam on, you will really appreciate the fact that all the mirrors, even the ORVMs are auto dimming. The car gets the interior ambient lighting package with two colour options, orange and white which improve the ambience at night. Quality of plastics is top notch as expected on a CBU product (yes, the 320i is a CBU as opposed to the 320d which is made here). The driver’s seat is comfortable , but lacks lumbar support. 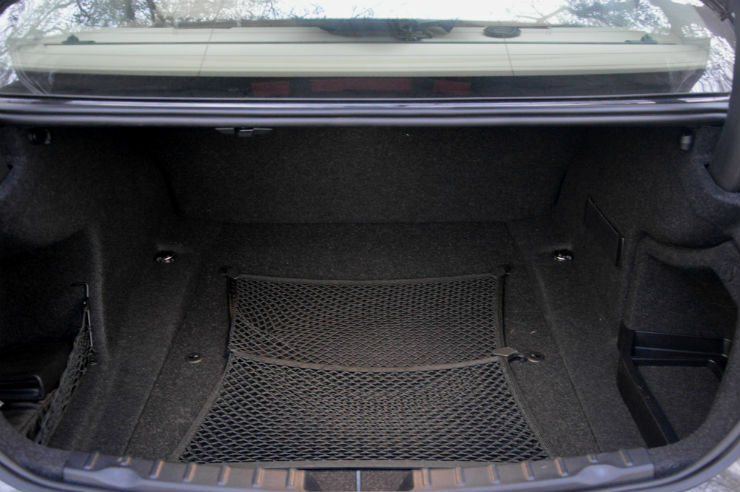 Overall space is adeqaute, but getting into the rear seat will be tough for older people. Let’s get to the heart of the matter which is the main reason behind this review. 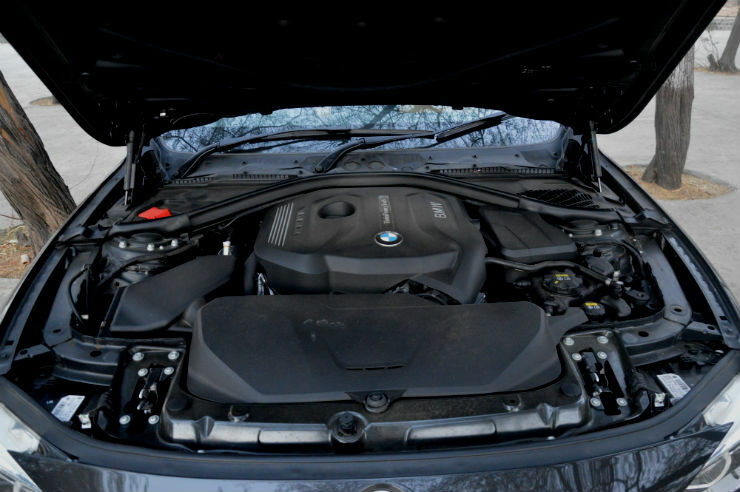 So, the 320i is powerd by a 2.0 liter turbo-petrol unit. 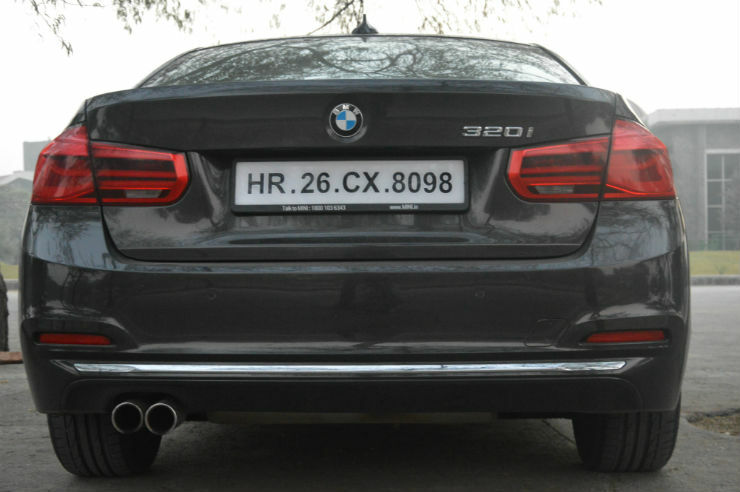 Unlike the previous 3 Series that also came with the 2.0 petrol, this one is an all-new B48 unit that produces 181 Bhp and 270 Nm. This is the same engine that is currently offered on the new Mini Cooper S. The engine is mated an 8-speed automatic gearbox. The engine is very refined and barely audible while you are driving. Start her up and she settles into a very gentle purr. Put the car into drive and step on the gas and the first thing you notice is how revv happy the engine is. If you keep the throttle pinned, it will revv all the way till 6500 rpm, even when on normal D mode. At this time, the 4-pot motor has a sweet sound to it. No, it doesn’t have the crackles or the bangs that the Mini gets, however it is still pretty nice sounding. The 8-speed gearbox in the Luxury line is the Sport trim gearbox and it does a great job. Shifts are barely felt in day to day driving. It is only when you put the car in the Sport mode that you experience a little jerk while upshifting. Though the car comes with paddle shifters, you barely feel the need to use them in daily driving. Go anywhere near the throttle and all you will see is the revvs climb, something that you will certainly enjoy till it is time to fill her up with fuel. Be aggressive and you will not even see it return 2-digit fuel economy figures, however if you drive with a gentle right foot, that can change. At cruising speeds, say about 100-120 kmph, the cabin is extremely silent. Both engine noise and wind noise are very minimal which means long distance mile munching will be easy and comfortable. 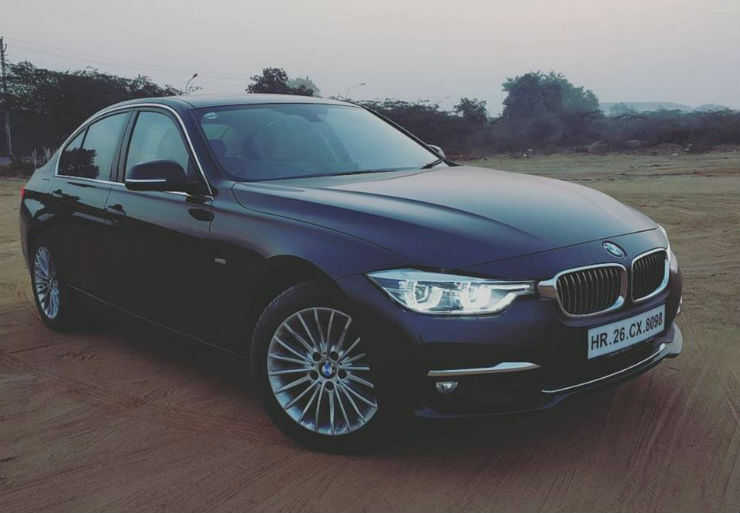 As mentioned above, the 320i comes shod with 17″ rims and has a tyre size of 225/50. Though it comes with RFTs, the ride quality has improved by leaps and bounds. This one just glides over most of the bad roads you put it through, which is something you really don’t expect to come across in a BMW. Handling wise the car continues to be very dynamically involving. The steering feedback is really good, given how comfortable the suspension is. Yes, if you are driving at higher speeds, you do feel some amount of body roll creeping in, but that is very minimal. If you are driving with the traction control fully off, you will see the rear kickiing out just a little. The car comes with Launch control too. To activate it, all you need to do is to put the car in Sports + mode, put the car into sport mode on the gearbox, keep the left foot on the brake and press the accelerator hard. You will see a notification pop up saying launch control active and you’re ready to go. It is surprising how linear the power delivery is, given that this is a turbocharged vehicle. Mash the pedal when cruising and there is a hint of hesitation before the car surges ahead. There is enough power available through the revv range. While the car is quite large at 4.6 meters, this fact is completely masked the moment you’re behind the wheel. The car just shrinks around you and you can chuck it about very easily. BMW previously had the 328i on sale which was a gem of a car. This one can’t come close to matching that level of performance, but it is no slouch either. 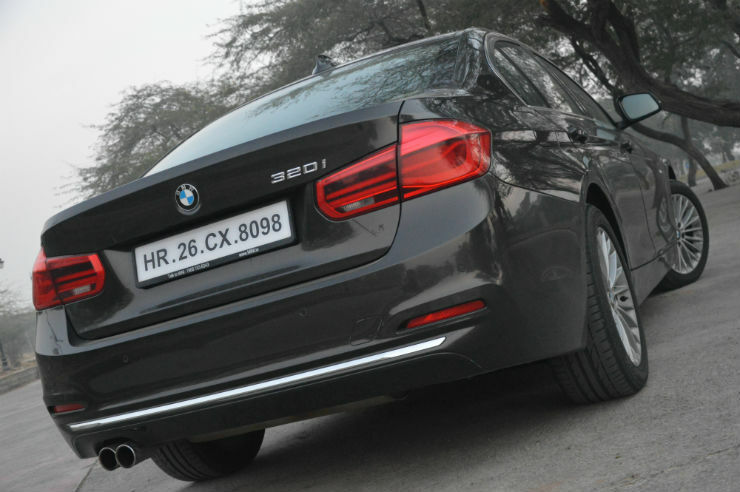 The 320i is priced at Rs 42.70 lakhs for the Luxury line and Rs 36.90 lakhs for the base Prestige version. If you are in the market for a driver oriented luxury car that is comfortable as well, this is the way to go.